Relax in the pool while the kids play in the playground. 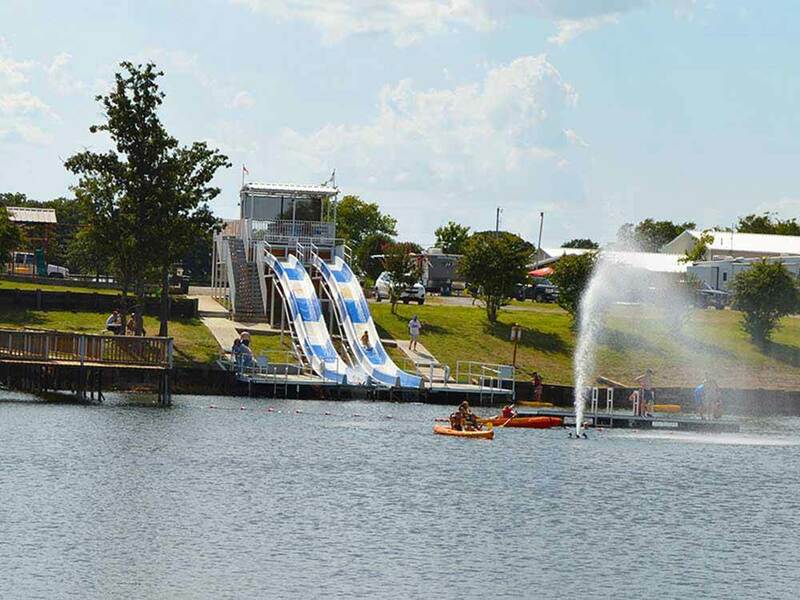 Fish off our extended pier or enjoy our water slides. Great pull thrus with full 50 amp hookups & free WiFi. Nice clubhouse. RV parts & repair shop on-site. We stayed there one night on our journey to Colorado, Host were very nice and courteous, restrooms were extremely clean and grounds were very clean, just wish we had more time to spend there. R. Thibodaux, Marrero, la. I travel all around the country for work and have seen all sizes and types of RV parks, this one was one of the best. Not too far from the interstate, not too far from Ardmore. My space had a nice large level concrete pad to park my camper. It was large enough to handle my 38' 5th wheel. There's a nice large pond in the middle of the park that has a pair of water slides going into it. It looks like it would be a blast in the summertime. If I'm ever back in Ardmore you better believe I'll be back. The staff was great and super helpful. The bathrooms/showers were always very clean. They had a Superbowl party for the park at the club house while I was there. The park attendant came and invited me over personally. Camping here was a great experience all around. Very nice campground in all ways. The only thing I did not like is the campground is right by I35 and you hear loud traffic noise day and night. Well developed park with improvements being done. Good helpful staff and excellent facilities. Served our 5 RV group with good sites and friendship. We can be sure to return. They are building a lot of add ons. Nice!! !